Creativity is a fickle thing, seems to be feast or famine, on a roll or nothing at all. I’m in a nothing phase at the moment so I’m pushing my way though it by just doing stuff at random. Today I grabbed a piece of vintage hand-made paper, really lovely, and a lump of carbon. First of all, I turned the carbon lump on its side and scraped it horizontally across the textured paper, varying the pressure to achieve different tones. 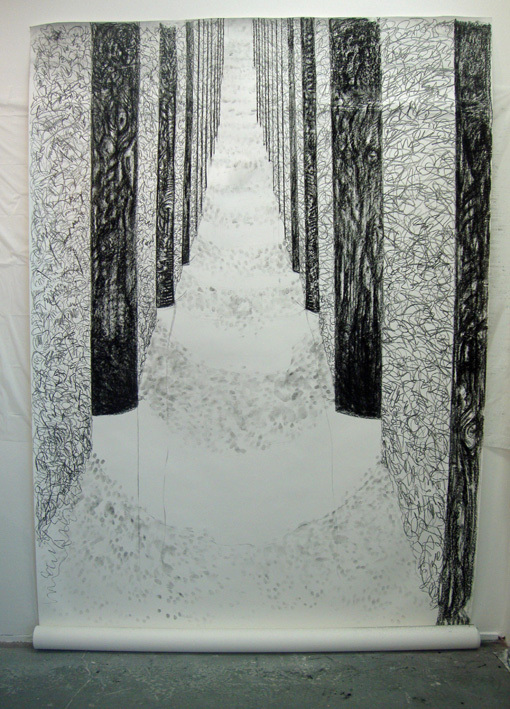 Then I turned it through 90 degrees and using the point of the graphite stick, dragged thin lines up and down the paper. It’s not great art, but it’s necessary to just play sometimes. I did something unusual at the weekend. Fellow artist Claudia Mollzahn was holding an art event at Volcano theatre in Swansea’s High Street and offered me window space to develop something over two hours. I’ve had some translucent drawing film on a roll knocking around the place for ages so I decided to stick it on the window and draw what I could see of the street behind it. Unfortunately I made the mistake of not trying it out first and when I put it up, it wasn’t as translucent as I’d thought, I couldn’t see anything through it. Then my young nephew came to the rescue. He was easily persuaded to sit in a chair playing games on my phone while I drew a massive portrait of him. It was great drawing on the inside of the window, loads of people passing by stopped to look at the drawing being developed from the other side. I tried out different drawing materials, some worked, some didn’t. I sketched the basic drawing with a graphite block and some white conte crayon, My home-made walnut ink was a wash out, it wouldn’t stick to the surface of the film at all, so I used Bideford Black to fill in the dark areas and carbon for the lines. Making a mistake often leads to something good. If you want to see some of my other artworks, please click here. 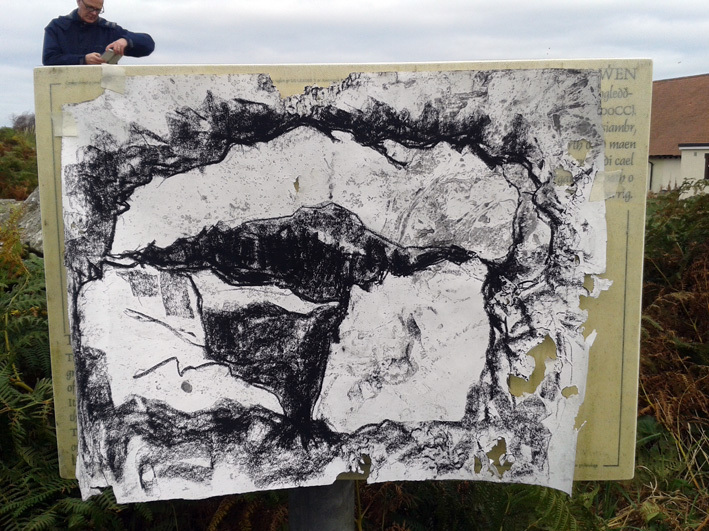 A few weeks ago I spent a couple of days in Pembrokeshire, drawing ancient monuments mostly in the rain. When I’m drawing something from life, I concentrate on getting the appearance and proportion right, doing a fair representation. 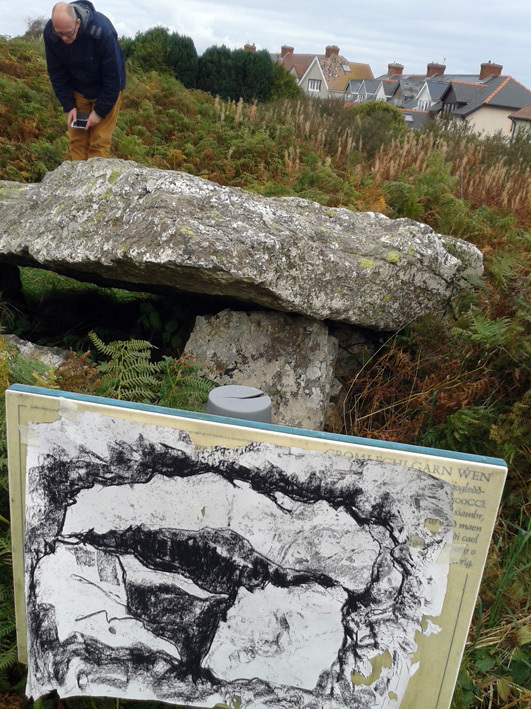 I often use these original drawings as source material for something else, usually a print – an etching, silkscreen, monotype – but today I thought I’d try doing a drawing from my original sketch of Carreg Samson, a dolmen perched above the North Pembrokeshire coast. It was quite liberating as all the basics had already been done so I could focus on experimenting with making marks and developing the mood of the drawing. I only spent a few minutes on this but I think I might do some more and spend more time on them. I worked with carbon into an A3 Daler Rowney sketchbook. Trekking around North Pembrokeshire yesterday, hunting ancient burial sites, took us to Goodwick near Fishguard (what are the fish guarding?) 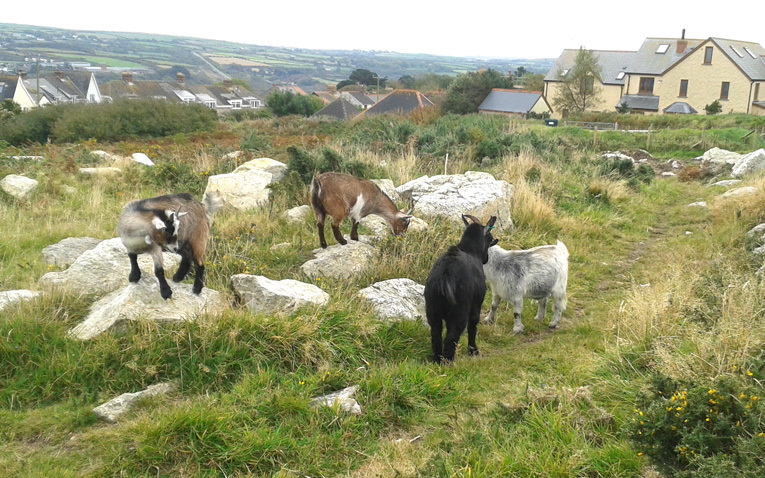 and a bit of a trek along the cliff path towards Strumble Head, through a housing estate and along an overgrown path between back gardens and a barbed wire fence keeping goats at bay to the three prehistoric chambered tombs known as the Garn Wen burial chambers. They’re quite different to the other sites we visited, they are very low, the uprights mostly submerged and the capstones barely above ground. They’re hardly visible amongst the bracken. The other sites are beautifully manicured but this one has been left largely unvisited, going by the state of the hardly used, overgrown path. I’d forgotten to take along a drawing board but there was a conveniently placed notice board on the small site so I taped a piece of marbled Fabriano Accademica to it and drew quickly with a piece of carbon. We were up above the cliff and the wind was gusting, very chilly for drawing. When I marbled the paper some months ago, I used black oil paint mixed with a little turpentine. It was very smelly so I put it into the garden to dry, forgot about it and found the paper next day covered in holes nibbled by snails. I like the effect of the rough drawing of the rough cromlech on the rough paper. 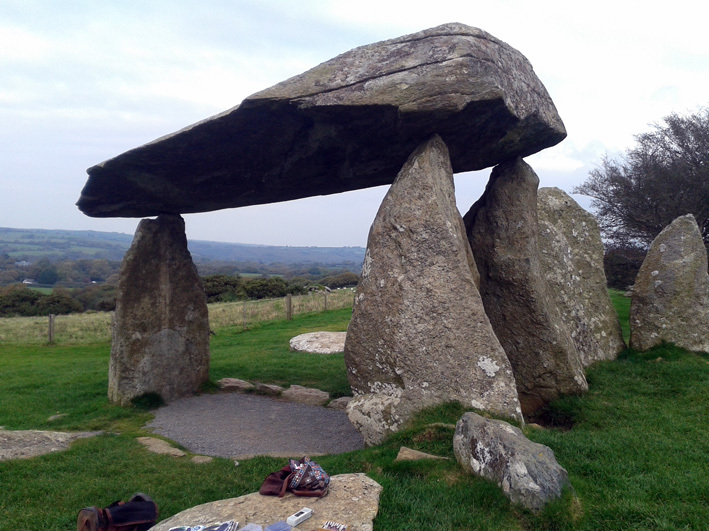 I spend a couple of days in Pembrokeshire drawing dolmens. 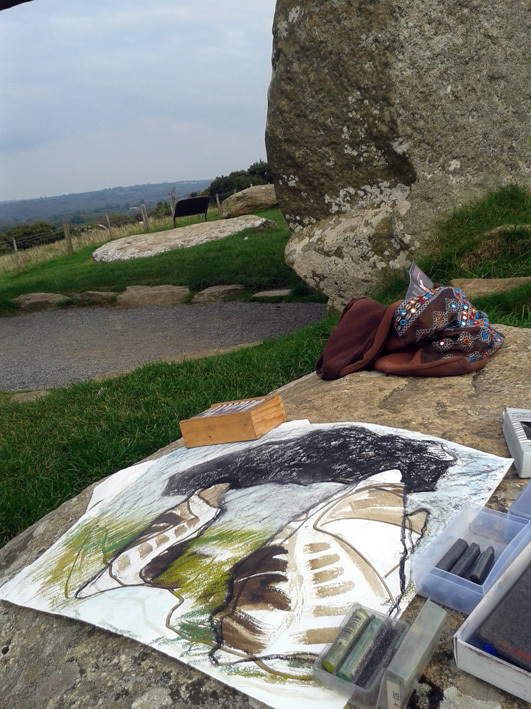 I managed to get to 4 sites and did some sketching in the field, not easy as I forgot to take my drawing board so I was drawing on grass or even the stones themselves. I tried out some different techniques. 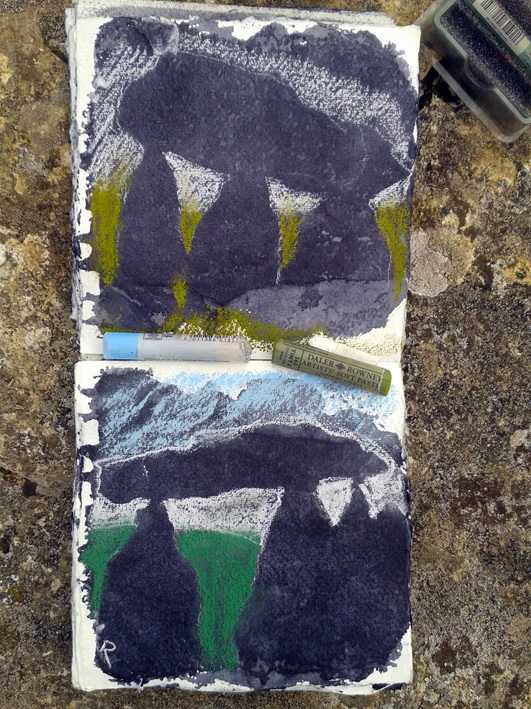 These first two drawings at Pentre Ifan are drawn into my small Khadi handmade paper sketchbook that I had pre-coloured with a dark ink wash sploshed on randomly with a sponge. I drew with my Daler Rowney artist’s oil pastels, using white, pale blue and two tones of green. 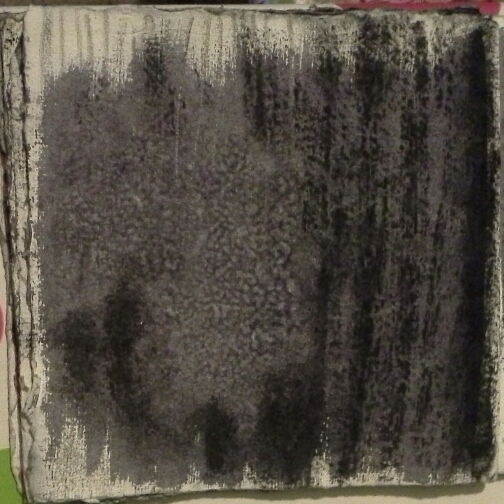 I filled in the negative spaces with the pastels – the dark stones are the ink-washed paper. Then I tried experimenting with a piece of Fabriano Accademica paper that I had already drawn on some months ago. I visited St. Paul’s catacombs in Malta last Winter and when I came back, I developed some of my sketches into larger drawings with my home-made walnut ink. I didn’t much care for most of them and I’ve been planning on re-using them and this is my first attempt, drawn with carbon and oil pastels, both by Daler Rowney. I like the idea of overlaying an ancient burial chamber onto an ancient burial site, but I’m not sure what I think of the drawing itself. I’ll sleep on it. I carried on working on tiny recycled fragments of beautiful papers today, Somerset, Bockingford, BFK Rives, Hahnemulle, and found myself relaxing into it. Yesterday was frustrating and difficult, as it should be, I was trying something new and there’s no reason why it should be easy. Today I was much less prissy and precious about what I was doing on the paper. At the end of the day it’s just a fragment of paper and if I don’t like what I have done, I can gesso over it. In fact I did that to a couple that I had worked on yesterday anyway. All the pieces of paper are size A6 or smaller and I have been working on them with gesso, willow charcoal, carbon, graphite, Indian ink wash, home made walnut ink, conte crayon using brushes, fingers, wet wipes and cotton buds to blend and fade the marks. 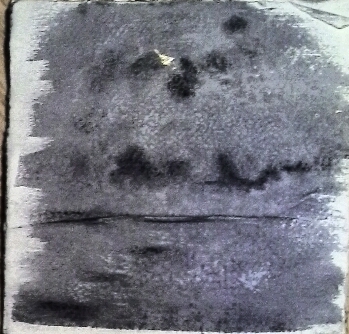 I sponged a load of Khadi handmade paper with Indian ink washes and the heavy texture of the paper created some lovely variations in tone and texture. I was stuck indoors today working at the computer so Husb and I went for a walk this evening, in the dark and drizzle. We went down to the beach which was very smudgy and atmospheric in the gentle rain. When I got back, I looked through the sponged papers until I found some that evoked the atmosphere we’d been walking in. I rubbed some black carbon and white chalk onto parts of it. I normally work directly from life, so it’s a big change for me to work completely intuitively and at random. I love paper! I love it, adore it, when I was little I even ate it! I love to possess as many papers as I can afford. I love to try them out with different media and see what they’re capable of. This is handmade Khadi paper. I doused it with an Indian ink wash using a natural sponge and the texture of the paper created some nice stippling. I have been trying to work out how to draw local landscape, which is very atmospheric. I particularly want to try out ways of capturing twilight and darkness and preparing the paper in this way is showing some promise. I added some highlights and lowlights with chalk and carbon but most of the work had been done. I’ve spent the past two days at the Creative Bubble artspace in Swansea City Centre, with the 15 Hundred Lives art collective. We have the venue every month to give us the space to work together, try out new ideas and we open the doors to the public so that people can drop in and see how artists go about creating a piece of art. It doesn’t just appear fully formed on a gallery wall! I worked on a massive drawing, the second in a series I am planning to do over the next year or so. The first, on the right in the pictures, was completed and displayed as part of my installation at Fringe Arts Bath back in June. They are inspired by a visit to Berlin a couple of winters ago, when there was thick snow on the ground. I saw the Holocaust Memorial just after a fresh snowfall. It was beautiful and haunting. 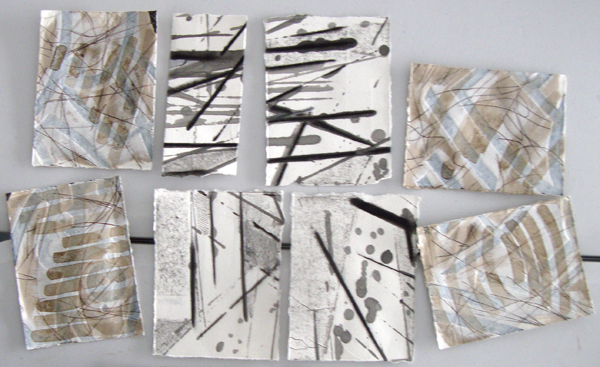 I worked with carbon and graphite blocks onto Fabriano Accademico paper, approximately 150cms by 200 cms. I’m carrying on with working dark on dark. 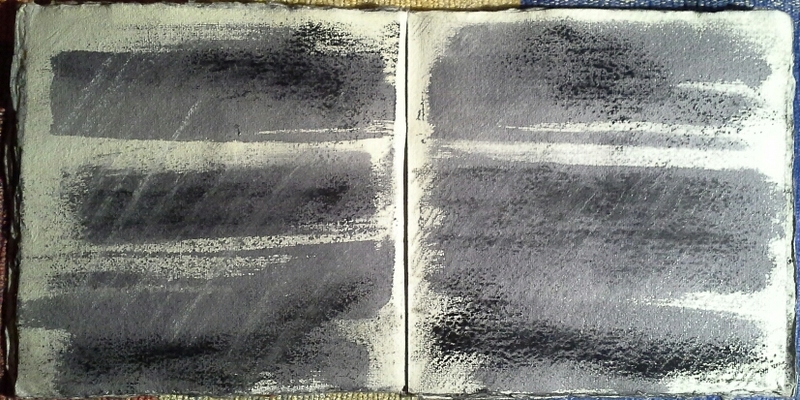 I prepared lots of pages in my handmade Khadi sketchbook with an Indian ink wash and I’m working on top with random marks using different drawing materials such as carbon, graphite block, black pastels, black oil bar, compressed and willow charcoal. I admire artists who work from their imagination; it’s something I find very hard. I have always preferred to work from what’s around me. I’m actively trying to break through the blocks that are stopping me by doing these drawings.